As I mentioned, I am working on building my daughter's summer wardrobe. I made this sundress last week. While I was sewing it, I was so excited because I loved how it was looking. THEN, I added the sleeves and I wasn't sure how I felt about it anymore. I decided to put it away for a week. When I pulled it out today, I fell in love again. Funny how sometimes you need to not look at something for a while. Seeing it on this cute thing helped a little. I truly feel she could make a potato-sack look good. I know I might be a little biased though. I love the crocheted ribbon detail around the bodice. I had just enough to add it to the bottom too. I bought a spool of it at Walmart for $2.97. I used a similar cream spool on this dress. I bought the main fabric on sale at Joann's. Are you wondering what part was the refashion? All the white fabric came from a white shirt my husband never wore. I think he got it from my brother. Although it's not raining today, we are still waiting for summer to arrive. I used this pattern from Simplicity. I followed a link to the pattern after seeing this dress. 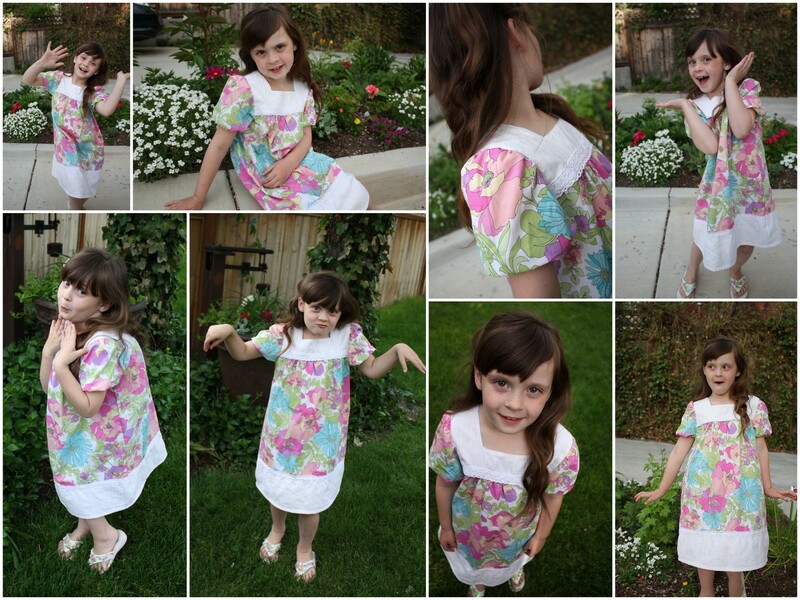 I used the size 4 pattern and my daughter usually wears a size 5 or 6. Very beautiful, your little girl and the dress! You have the cutest refashions!! she is gorgeous! and you made another winning dress! So has she been named BEST DESSED yet???? Each one is better than the next. I love the whole dress and the fabric is too die for, my Joanns does not have that. What a beautiful young lady and cool dress..You do beautiful work..
That fabric is super cute. Another great job. Maybe your next dress could have ribbon? I like the things you make ánd the beautifull little lady you have. You can be proud of both.